Com-Pac International is willing to execute mutually agreeable non-disclosure agreements covering customer-unique proprietary products. Com-Pac International has extensive product development capability, as approximately fifty-percent of product sales is derived from uniquely developed products for specific customer applications. Product development capability extends to design, testing, manufacture and production integration of manufacturing equipment, as well as end-products. We are able to adjust the configurations of products to comply with your specifications. Headquarters, manufacturing, testing and shipping are located in Carbondale, Illinois. Various warehousing facilities are available at other nationwide locations. Com-Pac International has expanded twice in the last four years. The first addition was 10,000 square feet to accommodate additional manufacturing equipment production facilities and for the addition of a six-color, central impression printing press. The second addition was 10,000 square feet to relocate our FDA white room into a state-of-the-art manufacturing facility dedicated exclusively to medical white room products. Future expansion plans call for an adding 10,000 – 15,000 square feet for additional film and reclosable profile extrusion capability to accommodate current growth trends. Com-Pac International maintains testing data on all products in accordance with customer, FDA and internal policies and procedures. Lot sample testing is conducted in accordance with MIL-STD-105. As a fully integrated extruder, printer and converter, very few production components are purchased from subcontractors. Certain raw materials such as polymer resin and unique poly films are purchased from outside vendors. Com-Pac International owns all tooling and machinery used in production. Supplier performance is measured by rating suppliers during periodic site visits by Com-Pac purchasing and Quality Assurance personnel. Supplier performance is reviewed annually. Application of supply management consists primarily of supplier certification subject to qualification criteria established by Purchasing and Quality departments. Com-Pac International has begun ISO 9001 Certification activities. Phase I, Quality Policies, and Phase II, Quality Procedures, have been completed. Work on Phase III, Quality Work Instructions is proceeding. Com-Pac International is a FDA Registered Device Establishment, as Manufacturer, Contract Manufacturer and Initial Distributor. Our Registration Number is 1419810 and is current through CY-2012. A copy of our registration certificate is available upon request. We have certified certain food packaging equipment, which we sell to be in compliance with the CE Mark specifications. Com-Pac International Provides Fast Service! Price lists are available for catalog items. Most custom quotes are provided within 24 hours of request. Lead time for quotes requiring special tooling vary. Pricing is valid for 30 days, and we encourage blanket order purchasing for best lead times and prices. Standard pricing doesn’t include delivery. A minimum billable amount of $150.00 and approved credit are required for open account status. We evaluate credit through D & B services. Payment for orders made on open accounts are due in 30 days. Payment terms for tooling may vary Visa or MasterCard accepted. For customers with an open account status at Com-Pac International use our on-line Order Form or Call 1-800-824-0817 to speak directly with a sales representative. Or E-Mail us at Sales@Com-Pac.com. For most efficient processing, please include all product specifications and delivery requirements on your order. It was 1970 when the company that is now Com-Pac International, Inc. received its first patents on the world’s only liquid-tight, yet reclosable bag. Better solutions to packaging’s most formidable challenges have continued to make Com-Pac a leading innovator in the design, engineering and production of specialty plastic soft goods. Today, Com-Pac International, Inc. is a fully integrated extruder, printer and converter of custom plastic packaging for a wide variety of medical, food service and industrial applications. With the experience and resources to meet the most demanding product specifications, here are a few more ways Com-Pac meets the challenge — One customer at a time! It takes much more than the latest technology and equipment to meet today’s demanding market. It requires the consistent support of trained and knowledgeable people who emphasize quality of both product and service. That is why Com-Pac people are more than employees, they’re partners. Com-Pac employs approximately 200 full and part-time direct production, engineering, management and support personnel. Direct production personnel are non-union, operating three shifts, seven days a week. All full-time employees enjoy a comprehensive medical benefit package including major medical, life, disability and dental insurance. Profit and gain sharing programs allow all employees to participate in the success of their company. Our market teams who are trained product and capability specialists will coordinate our considerable resources to see that your packaging project is on time and on budget from R & D to final delivery. The indicator of true quality goes beyond the combination of select raw materials, high-tech machinery and skilled, dedicated personnel. It is the group of people teaming their efforts to continuously improve products and processes. A configuration control program which documents each product’s dimensions, construction and performance criteria to insure consistent product conformance with established standards, to prevent changes without your authorization and to provide traceability from end-item to raw material. Our wide range of production and conversion equipment provides us with the flexibility necessary to supply the most specialized products conceivable. Our central location and national distribution channels provide cost-effective shipping to all parts of the country. Com-Pac conducts all manufacturing, warehousing, shopping and administrative operations from its 87,500 square foot headquarters facility in Carbondale, Illinois. 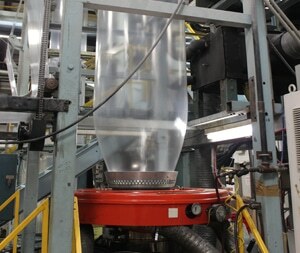 Extrusion of polyethylene film and profile fastener with custom blending of specialized additives and colors. Up to six color flexographic printing, according to your specifications using your plates and artwork or ours. High speed and high flexibility converting machines for bags, shapes, sleeves, sheets and rolls with tape, zipper, hot glue and tamper evident closures. Medical device manufacturing is conducted on-site in our FDA inspected White Room. Extensive in-house machine shop capability for the expert design and manufacture of custom tooling, dies and production equipment. Com-Pac is fully EDI operational for efficient order processing and product shipment. Bag making is easy. Designing solutions for today’s flexible packaging challenges isn’t. It takes a fully integrated operation to bring your special packaging need from concept to production. From materials specification to machine design, Com-Pac International, Inc. offers the full range of resources to meet your particular applications. Design and Production Engineering staff with over 100 years of combined experience in the design and manufacture of poly products and equipment. Computer Aided Design and Manufacturing (CAD/CAM) capability to insure conformance of machine capability with product specifications. Com-Pac has held as many as twelve United States Patents on poly manufacturing methods/apparatus and as many as fifteen domestic and international patents pending. Material research and specifications for applications requiring breathability, odor/chemical barrier properties, controlled water solubility, compostability, puncture resistance, electrostatic discharge (ESD), static resistivity, high clarity, and many other specialized properties. Product prototype sampling and first article approval to insure that product design meets your requirements. Product design and performance testing to quantitatively evaluate such characteristics as seal strength, dart impact resistance, internal pressure capability and leakproof validation. Production tooling design and manufacture utilizing Com-Pac International, Inc.’s extensive in-house Machine Shop capability further insures control of the manufacturing process by providing the right tool for the job every time.